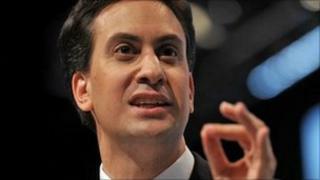 Ed Miliband has said he does not "give a damn" if voters see him as "weird". The Labour leader told BBC Radio 4's Today programme he saw himself as "a pretty normal guy", but matters of voice and appearance were unimportant. "The times are too serious, the issues are too grave, for us to say it is not about substance," he said. Mr Miliband joked in his conference speech about his "nose job", which some in the media had speculated was designed to make his voice less nasal. But the Labour leader told delegates in Liverpool he had a "deviated septum" in his nose which needed "repositioning". Asked whether he was concerned that negative comments about him being "weird" could affect his chances of becoming prime minister, he replied: "Other people make their own judgements. "I think I'm a pretty normal guy. It's in the eye of the beholder. "I don't give a damn about that." He added: "It is about substance. It is absolutely about substance. "The problems our country faces are so serious that substance matters, and I have got an old-fashioned view - substance wins out." A ComRes poll of 1,000 people for the Independent earlier this week found that 24% felt that Mr Miliband was a credible PM-in-waiting, against 57% who said he was not. Focus group research conducted around the UK by Conservative peer Lord Ashcroft earlier this month found floating voters regarded the Labour leader as "weird". The report states: "'Weird' was often the spontaneous verdict as soon as Mr Miliband's name was mentioned, before they had a chance to choose the card bearing the word. "Many did so almost apologetically, as though they would use a kinder word if they could think of one. A number of factors were mentioned. "Standing against his brother for the leadership (by far the best-known fact about him), his apparently reluctant marriage, and his manner of speaking all contributed to an overall impression of oddness." But it adds: "For those more warmly disposed to Labour, though, Mr Miliband was a blank canvas onto which they projected what were essentially hopes, or at least the benefit of the doubt, rather than fully formed views." Twelve focus groups were held in London, Taunton, Leeds, Birmingham and Northampton between 11 July and 1 September.